Brought to me by the weekly Fulton River District Association bulletin, the creators of the world-famous restaurant, Alinea, are making their presence known in the Fulton Market. Currently under construction, two new businesses are taking shape at 953-955 W. Fulton Market. Next Restaurant will explore world cuisine and instead of taking reservations, your booking will be made more like a theater or a sporting event where your tickets will be fully inclusive of all charges, including dining service. Obviously, ticket prices will depend on the time and day of your visit. The Aviary won’t technically be defined as a bar or a lounge, really. They’ll have chefs producing the drinks so not only will they have the classic cocktails, but you can bet they’ll have some amazing and beautiful cocktails to compliment the menu at Next Restaurant. Both Next Restaurant and The Aviary are slated to open later this year. 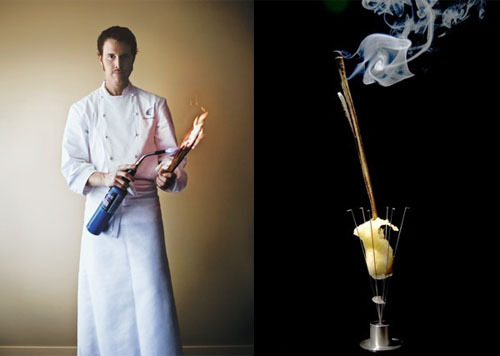 Chef Grant Achatz of Alinea and one of his food creations. 2010 Annual Meeting for the Fulton River District Association Wednesday at 6PM. I know I’m excited for the tour of the relatively new Chicago French Market…and the samples! Check out the Fulton River District Association website by clicking HERE! Trio in the Fulton River District and Mondial in River West likely to go rental soon. Another Crain’s Chicago Business article about the most recent industry troubles. Mostly because of very poor sales figures, two more condo buildings, Trio, located in the Fulton River District and Mondial, located in the River West neighborhood may go rental very soon. The Mondial, a 141-unit condo project in River West, and the 100-unit Trio high-rise under construction in the West Loop could go rental in the coming months, a switch that has become increasingly attractive in an overbuilt and cutthroat downtown condo market. “We’re just trying to figure out how fast all the other guys who are dumping units will clear the marketplace,” says Jack Berger, the developer of the Mondial, a nearly finished 15-story building at 900 W. Huron Street. Mr. Berger says he recently canceled about 50 purchase contracts for condos in the project and gave the buyers their deposits back. Yet he hasn’t given up completely on condos, saying he expects to make a final decision by the end of the year on whether to switch over to apartments. Many condo buyers nowadays can’t get a loan to finance a new condo purchase, one reason downtown developers are sitting on so many unsold units. Switching to apartments could make sense for projects close to completion, allowing developers to trade a risky condo market for a more stable, albeit still sluggish, downtown rental market…. To read the full Crain’s article, click HERE! 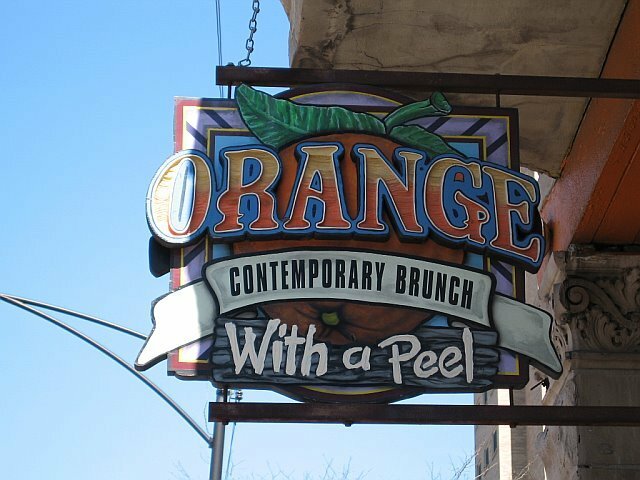 New location for Orange Brunch, with a peel at Halsted/Grand/Milwaukee! Construction update for Alta and Cirrus at K Station. Awhile ago, I posted some construction pictures of Alta and Cirrus at K Station. Now, a lot has changed with Cirrus at K Station being close to topping off and Alta at K Station has finally started to get taller. Take a look at the pictures and if you have time, take a walk over there. Alta at K Station is located at 555 W. Kinzie Street and Cirrus at K Station is located at 365 N. Jefferson Street. Direct view of Cirrus at K Station. Madonis Development is the developer behind these five three-bedroom homes, starting at over 1.29M, with commercial space on the ground floor and residential duplex homes on the second and third floors. With a model home located at 813 W. Fulton Market, Madonis Development built these homes hoping the homeowners would live in the residential space above and operate a small business in the commercial space below. The Fulton River District, with a mixture of meat packing warehouses, restaurants, retail, and residential units, is uniquely gritty. For this development, I enjoy the different colors of brick used in the construction and I also like the buildings from the back but I am unimpressed with the front of the buildings. Granted, the homes are still under construction but the large, blank void above the third story windows could easily have some sort of ornamentation. Just think how much detail/stone or brickwork could be done to enhance the appearance. For more information on this great development, contact Madonis Development at 312-421-2003. On Saturday night, My sister and our two friends came to Chicago to go see Sixteen Candles at the Cubby Bear. BUT before we went out to the bar, we had to fill up on some good food so we went to Paramount Room for some $10 Kobe burgers and a pint. All four of us ordered the Kobe burgers which come standard with lettuce, tomato and onions. For an extra $2 you can get french fries and a garlic aioli sauce for dipping which I highly recommend because the aioli is delicious on both the fries and burger. The burgers were delicious and the fries were some of the best I’ve had in years so I am definitely going to go back to Paramount Room in the near future. Our server was quick and attentive but you could tell she was bored as hell. After a big work event, we realized there was no leftover food for us so a bunch of my coworkers and I drove over to Iguana Cafe, located at 517-19 N. Halsted Street, in the Fulton River District. Now, I have gone by Iguana Cafe a ton of times but this was the first time I’ve actually gone inside. The restaurant/lounge/internet cafe/other uses has a big open feel to it with plenty of seating and as soon as you walk in, you’re greeted with a refrigeration case full of different cakes. We were immediately sat and our waitress was very nice and attentive. I ordered the Italian sandwich which is made with prosciutto ham, provolone, tomatoes, green peppers, oregano and olive oil served on Italian bread with a side of potato salad ($6.00). Oh, and I also ordered a huge slice of chocolate chip cheesecake ($4.00). The sandwich was delicious but being an always hungry guy, I wished it was bigger and had more of everything on the sandwich. Jon ordered the chicken pesto sandwich, I believe Michal ordered the Greek sandwich, Zev ordered one of Iguana Cafe’s crepes, and Mary ordered the smoked salmon sandwich. All sandwiches were basically around the same price as mine and everyone liked them. Iguana Cafe also serves alcohol which is great with the food and they have great hours too. The earliest Iguana Cafe opens up is 7am and they are even open till 2am on certain days of the week. Check out Iguana Cafe’s website for a full menu and a list of their hours.